At the invitation of Deputy Prime Minister Tugrul Turkes of Turkey, the government of Jordan, Vice President Sorena Sattari of Iran and the government of South Africa, Vice Premier Liu Yandong of the State Council will pay official visits to Turkey, Jordan, Iran and South Africa from April 17 to 27. She will also co-host with Nathi Mthethwa, Minister of Arts and Culture of South Africa, the first meeting of the China-South Africa High-Level People-to-People and Cultural Exchanges Mechanism. Q: You just mentioned the first meeting of the China-South Africa High-Level People-to-People and Cultural Exchanges Mechanism that will be co-hosted by Vice Premier Liu Yandong and the South African Minister of Arts and Culture. Can you talk about the details of this mechanism? A: In recent years, with the personal commitment of the two leaders and joint efforts of both sides, the Comprehensive Strategic Partnership between China and South Africa has been growing with strong momentum. With an unprecedented high degree of political mutual trust, fruitful practical cooperation across the board and brilliant people-to-people and cultural exchanges, China-South Africa relationship is at its historical best. A major mission of Vice Premier Liu's visit to South Africa is to launch the China-South Africa High-Level People-to-People and Cultural Exchanges Mechanism, an important part of the consensus reached between the two heads of state. This mechanism is the first of its kind between China and African countries, which covers cooperation in a wide range of areas such as education, culture, science and technology, health, youth, women, press, think tanks, tourism, sports, and local friendship. This mechanism is of high significance as we build up popular support for China-South Africa friendship, deepen our Comprehensive Strategic Partnership and expand people-to-people and cultural exchanges and cooperation between China and Africa. To officially inaugurate this mechanism is also an important part of implementing the outcomes of the FOCAC Johannesburg Summit. During the visit, Vice Premier Liu will meet with President Zuma, co-host the first meeting of the mechanism with Minister Mthethwa and attend the China-Africa Conference on Health Cooperation, the China-South Africa seminar on industrial park cooperation, the China-South Africa High-level Dialogue, the closing ceremony of the second China-Africa Youth Gala and the show to celebrate the inauguration of the China-South Africa High-Level People-to-People and Cultural Exchanges Mechanism & the 23rd anniversary of the New South Africa. Q: Deputy Foreign Minister of Russia, Gennadiy Gatilov, said on April 13 that the exact date of the next round of Geneva peace talks on the Syrian issue was to be decided, but was likely to be in mid-May after the May 4 Astana talks. Given the current situation, what's China's comment on peace talks? A: For the Syrian issue, China always maintains that political settlement is the only viable way. The UN needs to play a more active mediating role to maintain the momentum of dialogue and negotiation among all parties. And the Astana talks serve as a good complement to the Geneva peace talks. Given the once again heightened tension in Syria, it is especially important that the international community and all sides of Syria make good use of dialogue mechanisms, enhance communication to build mutual trust and continue to advance the political process to resolve the Syrian issue. 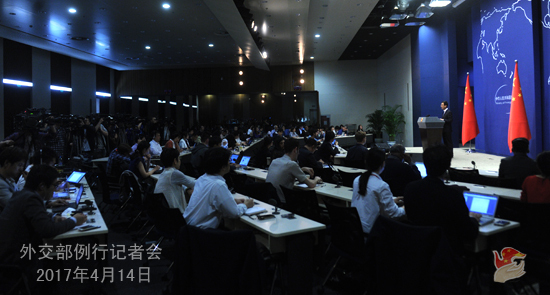 China will continue to support peace talks and negotiation. 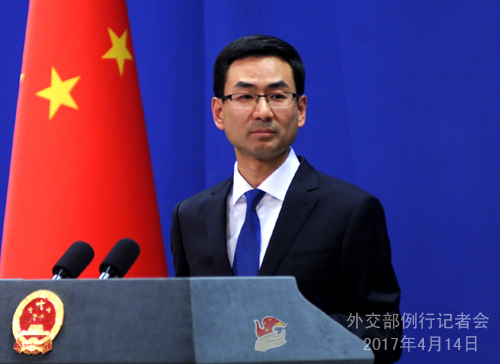 Ambassador Xie Xiaoyan, Chinese government's Special Envoy on the Syrian Issue, will revisit relevant countries in the coming days to compare notes with them on the Syrian issue and play an active and constructive role. Q: On April 13, US President Trump tweeted that "Things will work out fine between the US and Russia". Russian President's Spokesperson Dmitry Peskov said on the same day that both Russia and the US understand "the need to maintain a dialogue to search for solutions". What's China's comment on the prospect of US-Russia relations? A: We noted US Secretary of State Tillerson's recent visit to Russia as well as remarks from both sides. I want to reiterate that, a sound and stable relationship between the US and Russia, two permanent members of the UN Security Council and major countries with international influence, is conducive to world peace and stability and the endeavor to address global challenges. China would like to see continued improvement of Russia-US relations. It is a piece of good news for the world as well. Q: It is reported that all necessary materials for the deployment of THAAD have been delivered to the golf course in Seongju region in the southeast of the ROK. The ROK military suggested that THAAD would be deployed soon to counter the threat posed by DPRK's nuclear and missile programs. What's China's comment on this? Q: It is said that Special Representative Wu Dawei might visit the DPRK. Do you have further information? A: My colleague has briefed you about Special Representative Wu's visit to the ROK. As for the visit you mentioned, I have no information on it. Q: According to the Associated Press, the DPRK is ready to have another nuclear test. It is reported today that evacuation has begun in some part of the DPRK. Is China prepared for a situation like this? There are still Chinese citizens visiting the DPRK. Will China give any suggestion for them? A: We also noted the relevant report. And we've been following closely relevant movement. Let me say that, first, the DPRK-related resolutions adopted at the UN Security Council have made clear that the DPRK should give up all its nuclear programs and stop all related activities. That's very clear in the resolutions. Second, given the complexity and delicacy of the situation on the Korean Peninsula, we have urged all parties on many occasions to remain calm, exercise restraint and refrain from actions that may escalate the tension. And actions of that kind are both irresponsible and dangerous. Third, China has long been committed to denuclearization of the Korean Peninsula, peace and stability on the Peninsula and a peaceful settlement through dialogue and consultation. 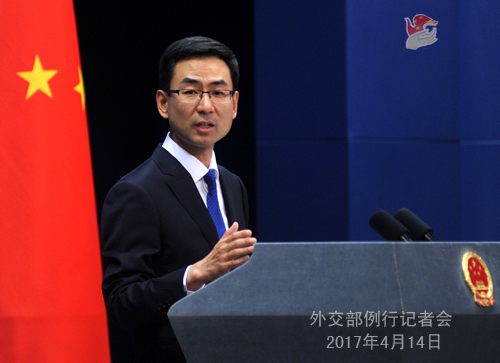 China will continue to stay in close communication with all relevant parties and endeavor to realize the above-mentioned goals.